UIC guard Godwin Boahen hit the game-winning jumper and finished with 16 points against Austin Peay on Wednesday night. Call him the silent assassin. Godwin Boahen may not be the most boisterous player on the court, but his impact Wednesday night was deafening. The sophomore guard from Toronto drilled a 16-foot jumper from the right elbow with 1.4 seconds remaining as UIC capped a rally from a 14-point deficit with an 83-81 victory over Austin Peay in the quarterfinals of the CollegeInsider.com tournament at the Dunn Center in Clarksville, Tenn. The Flames (19-15) advance to the CIT semifinals March 28 with opponent and site to be determined, improving to 5-6 in national postseason play with wins in four of their last five of those. Besides his grand finale, Boahen, who finished with 16 points, also was pivotal down the stretch for UIC, hitting 3-pointers on three consecutive possessions over 1:03 to turn a 72-67 deficit into a 76-72 lead with 2:43 remaining. The Horizon League sixth man of the year has quickly adjusted to his new role as a starter. UIC coach Steve McClain turned to his sharpshooter for the second straight game following the departure of small forward Dikembe Dixson to the professional ranks. Boahen had plenty of help as Tarkus Ferguson finished with 21 points, nine rebounds and a team-best four assists to shake off a six-turnover performance. Marcus Ottey contributed 17 points on 7-for-14 shooting and took flight for two dunks. Senior center Tai Odiase shook off early foul trouble and finished with 10 points. By coming back from down 47-33 early in the second half, UIC won its program record eighth straight true road after starting the season 0-7 in away contests. Freshman Terry Taylor, who racked up 31 points and 12 rebounds for the Governors (19-15), scored seven points during an 11-2 run to open the second half to put Austin Peay up 14. McClain burned a timeout to settle things down for the Flames. Ferguson helped turn the tide with a pair of 3-pointers to ignite an 11-0 run that was capped by another triple by Dominique Matthews, cutting the deficit to two. Taylor answered with back-to-back baskets to help push the Governors’ lead to 55-47 with 10:55 remaining, but UIC was far from done. The Flames finally caught up to tie the game at 63-63 on two free throws by Clint Robinson with 6:19 left. Austin Peay pushed its lead back to 72-67 after Steve Harris converted an old-fashioned three-point play with 4:03 left. Then the Boahen show began as he scored 11 points in the final four minutes. An Odiase dunk off a lob from Jordan Blount gave the Flames an 80-76 lead with 1:11 to go. The Governors trailed by one after a Taylor putback with 16 seconds to play, then Tre’ Ivory stripped the ball from Marcus Ottey and Blount fouled Dayton Gumm on a quick drive to the basket. Gumm split a pair of free throws with 10.4 seconds left to tie it up at 81-81. Austin Peay inbounded the ball, but Ivory missed a desperation heave from beyond midcourt at the buzzer as the Flames celebrated. Although the night ended in glee, things looked a little murky early on as UIC trailed by as many as 11 in the first half. Two Flames starters – Odiase and Blount each picked up two early fouls – and UIC turned the ball over 12 times. Despite all that, the Flames pulled to within 36-31 at half. The Flames shot 50 percent in the second half, hit eight of their final 10 shots from the field, and thanks to Boahen, wrote a happy ending with more chapters of this season to come. FLAMES FLICKERS: In a rare instance, UIC lost the battle of the boards as Austin Peay outrebounded the Flames 46-35. … The Flames committed just three turnovers after halftime in helping them rally from a halftime deficit to win for just the fourth time all season. … Things got a little testy when UIC’s Blount got his arm tangled up with the Governors’ Taylor with 2:13 left in the game. The officials reviewed the play, but it was ruled a common foul on Blount. … Boahen hit four 3-pointers for the second straight game and has hit at least one in 16 straight. … The Flames cleaned up from 3-point range (10-for-23, 43.5 percent) and the free-throw line (19-for-23, 82.6 percent). 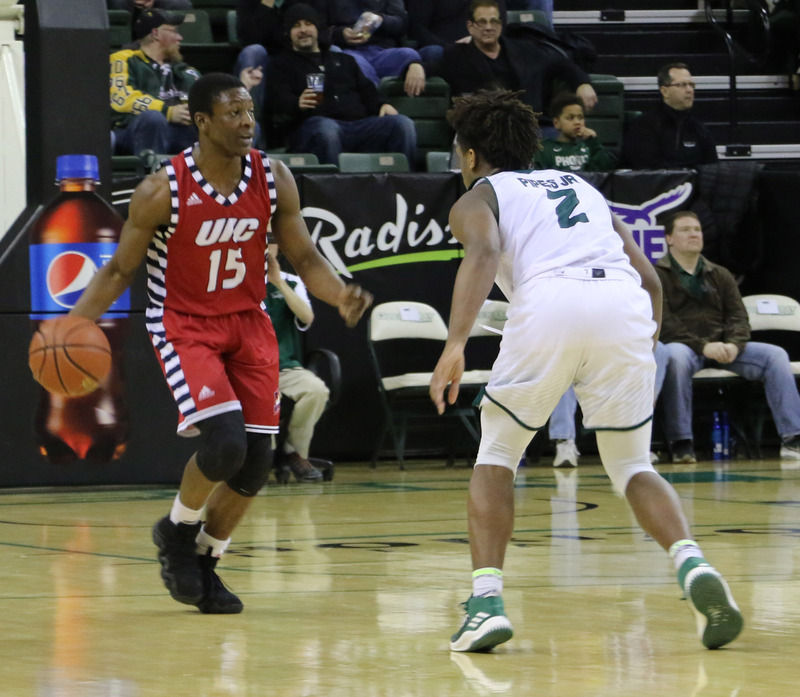 … Boahen also had a team-high three steals for UIC. … Wednesday’s game was the first meeting between the Flames and the Governors, of the Ohio Valley Conference.